If you want to complete projects in half the time, all the time, then you need CCPM+; the least expensive multiproject solution! View more presentations from LarryLeach. Do your project teams suffer from projects that are late, over-budget, or unable to deliver full scope? Are your project teams stressed by the lack of success and excessive project changes? You can change all that by moving to CCPM. You can supercharge your project team to achieve unprecedented success. Click the "Buy Now" button to check pricing...you won't be committed! See an overview of how to use it here. CCPM+ Now Does Multiproject! Click here to see! CCPM+ simply performs all the essential CCPM project management software support you need to plan and execute CCPM projects. Sizes and places Project Buffer, using either of two methods, or a combination. Sizes and places Feeding Buffers. Status with estimate of remaining duration. Reports project status with text buffer report. Enables project tracking and decision making with graphical buffer fever chart. Shows buffer status on Gantt chart with buffer penetration and color. Development guided by Project Management Professional (PMP). Development guided by author of Critical Chain Project Management. Supports Work Breakdown Structure (WBS). Enables MS Project™ controls over resource leveling (e.g. priority sequencing). Multiple types of resources on a task. Multiple number of resources of each type. Durations down to MS Project minimum. Manually over-ride critical chain selection. Critical chain and project buffer filter. Visible buffer penetration on Gantt chart. Gantt chart buffers change color with buffer status. Prioritized resource task list (only CC software in this price range to offer this!). MS Project 2007 and earlier versions of CCPM+ (3.x and less) generally supported windows language support for English, Russian, Korean, Portuguese, Spanish, and Japanese...but your MS Project language must match your Windows version. MS Project 2010 version and later by Advanced Projects will only support English versions. Contact us for resellers with other languages. 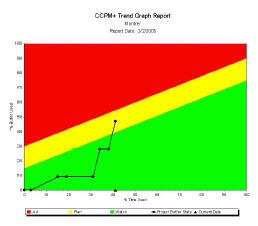 Download Trial Copy of CCPM+ for MS Project 2010 and earlier. To check price or order click below. You will not be committed to purchase and you do not have to join PayPal to order. Order 10 copies of CCPM+ for a discount for MS Project 2010 and earlier. CCPM+ inserts into MS Project (2002 or greater), giving you a simple toolbar to plan, execute, and control your project. You can run your trial copy of CCPM+ for 60 days without activation. You must purchase CCPM+ in order to activate it. If you are here to activate, be sure to run MS Project, and access the CCPM+ Help menu within MS Project under Tools/CCPM+/Help/ to obtain your machine code. (This works even after your icons have gone dim from exceeding the trial time.) Copy that code (Using Control-C), and paste it into an Email to Advanced Projects, Inc. We will provide you the activation code as soon as possible. If you would like a trial copy on CD, please send us an Email with your mailing address. User selectable colors define critical chain and buffer status. Buffers Buffers change color based on status. The ordinate is the percentage of project buffer consumed. 100% consumption means that the project competes on time. The abscissa is the percent of critical chain used: 100% corresponds to project completion. You can tell at a glance how the project is doing, and the performance trend. Latest version provides user selectable green/yellow/red thresholds. CCPM+ is the only single project critical chain tool in its price range to provide prioritized task lists for each resource. This report helps resources avoid bad multi-tasking by answering, "Which task do I work on next?" CCPM+ includes a comprehensive Help file, explaining the CCPM process and how to best use the software. OK, I WANT this tool to accelerate my projects to complete in half the time, all the time. How Much is this going to cost me? Click on the "Buy Now" button to find out (top of page). I need your help to answer this question. How much money are you going to save by completing your projects in half the time? How much more money is your company going to make by having the project results in half the time? How much more money is your company going to make by getting out twice the projects with the same level of resources? If you sum those numbers, that is how much CCPM+ is worth to you. Your cost would be how much the purchase price of CCPM exceeds that number. (Hint: it is going to be a much, much smaller price than what you will save. The right question is, "How much is CCPM+ going to make me?" Click on the button below to see the purchase information. Free copy of Larry Leach's newest eBook, Lean Project Management with your order. To check price and/or purchase, click the button "Buy Now" button at the top of the page. Click on the "continue" link above the credit cards to place an order. PS: I have used all of the other CCPM software before spending my money on developing CCPM+. Development cost much, much more than you are going to pay for it. I did that because, as a Project Management Professional (PMP), I found that the other offerings overlooked necessary key elements of project management. CCPM+ keeps all of those elements. Academic purchasers, please click here.